Yep, that's an emergency. Good for that city crew which spotted it, but it also raises the question of why this got so bad before inspections identified the problem. Or don't they do inspections in Chicago? 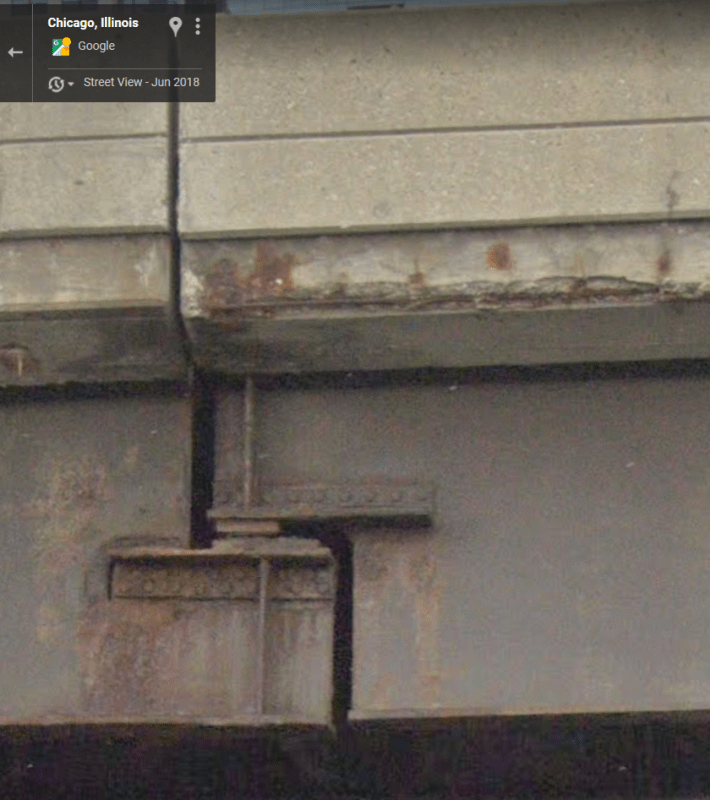 I know this bridge has been there for a long time, but it vividly demonstrates why halving joints should be avoided, IMHO. Looks like it was already failing in 2018.
and the dark "slot"? just off the end of the angle. Steel is a wonderful material, but it is not indestructible. My wife is always making fun of me whenever we walk through or under some structure and my eyes are scanning the framing for "issues". I'm going to show your post to my wife, JAE. Just so she knows that I am not the only one. I have found and acted on some issues over the years, maybe not as important as that one. Along with me, wife has started looking for suspect area. She finds some, too. I'm struggling to understand why the joint was put in there in the first place, with a pier just a few feet away. Why not just use a double bearing pier? My observation and question as well HotRod10! I guess if design looked bad when built, then it was just a matter of time to prove it was bad design! Second photo shows joint was shimmed to get roadway elevation uniform. Combine impact force/vibrations from roadway elevation difference and gap along with corrosion source and poor upkeep, no wonder the poor design finally "almost" failed. We still have a few pin and hanger connections around, but I've never seen one like that. HotRod - Riveted construction... that bridge screams late 1920's-1930's Great Depression time frame. Top priority... avoid material expense, concrete in this case. Why make an entire pier twice as thick when the spans can be supported as shown on a "thin" pier? You're probably right, SRE. Had they maintained a seal on the joint above and kept paint on it, it would likely have been fine. Expected to be closed until at least tonight while they erect temporary shoring towers to stabilize the girders. Permanent repairs would then follow. Scheinfeld said the cracks were first noticed by a crew making traffic signal repairs around 10 a.m. Monday. An engineering crew came to the scene and decided to shut down the roadway. 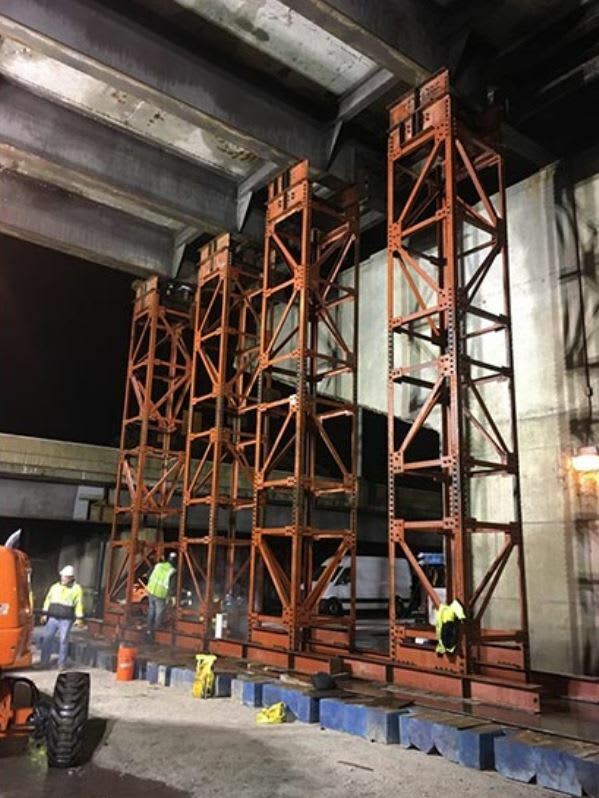 Seven steel girders run north and south along the roadway at that point underneath the viaduct structure near expansion joints, Scheinfeld said. Two of the seven girders have cracks. She said the city plans to install steel plates underneath the roadway as a permanent repair. Scheinfeld said the bridge is inspected every two years and was due to be inspected again in June. It was deemed in fair condition when last inspected in June 2017, she said. 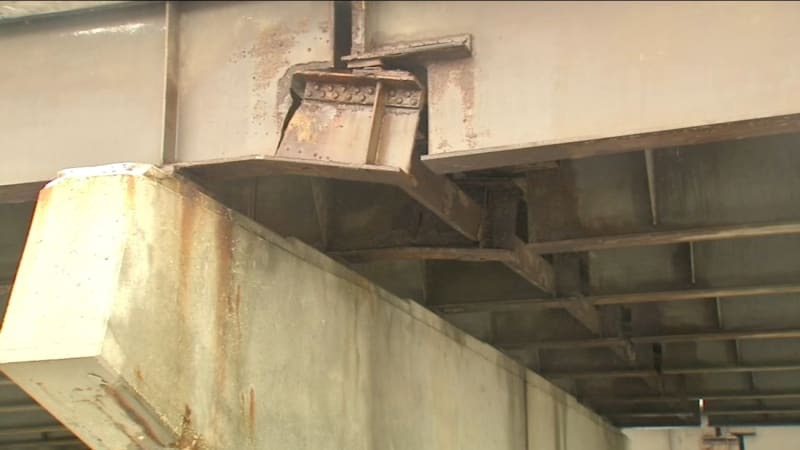 The term “structurally deficient’’ means that a bridge is in need of repair or rebuilding, according to the association. 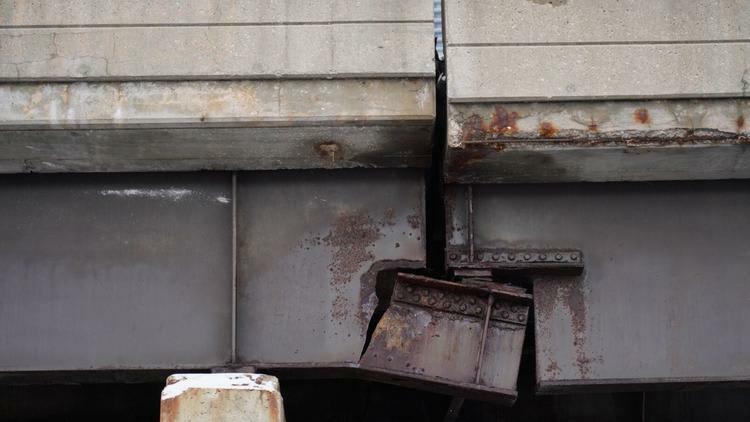 The Chicago Department of Transportation is planning repairs to this bridge together with the Navy Pier Flyover bike path construction project this year. Built in 1986! I missed the age by 50 years, or so. Bridge has had a hard life. They built this when they fixed the infamous S curve. That curve was a traffic engineering disaster. Two sharp curves in an area that would ice up with the lake water spray. In looking at Google-Maps, they have the same connection on the Southbound side too (a little further south than this one). to all the other engineers who have wives that mock you with things like "ooooooh steeeeeel" and "look at that concrete over there...ahhhhhh"
Built in '86 or 'modified in '86'? I wonder when it was shimmed, that should have been a red flag right there. 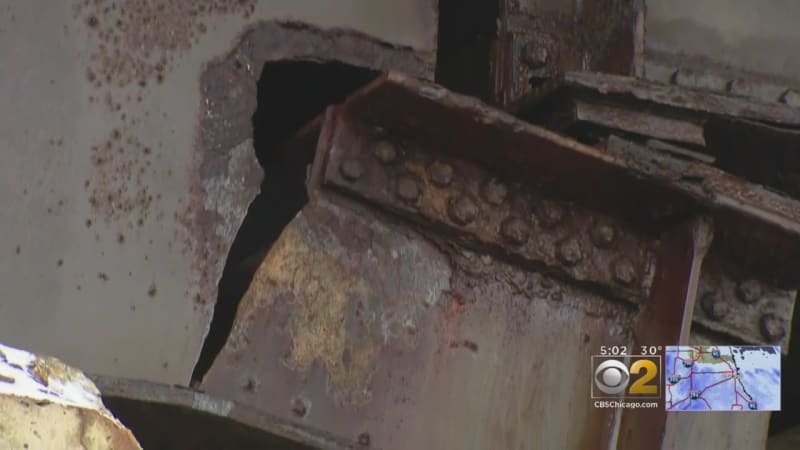 Yes, when there's rust on the edge of the fracture - not a good look for the bridge inspectors. For that connection to even work on paper it seems like there should be horizontal flanges/stiffeners at the seat, going at least the depth of the seat back into both beams. Shored it up - jacked it back level - weld on some plates - open to traffic. Hows that work with the current cycling temp extremes? Wish the pic showed the problem area. Why do those shoring towers look like they're riveted together? 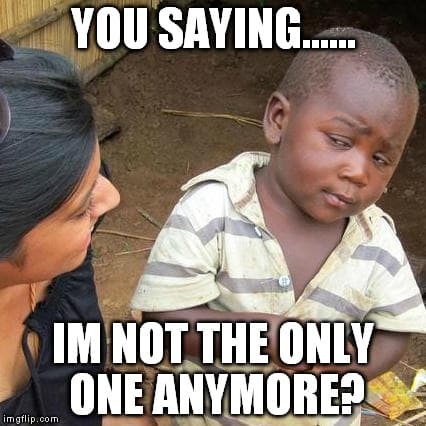 I thought that too Brad. The speed they appeared makes it likely they already existed just for that job. Did they have to fix this bridge before? No way guys... those are pre-fabricated, modular, bolted shoring towers. You'd have to call around for towers able to carry these kinds of loads, but in a town like Chicago, they're sitting in some contractor's yard somewhere. As far as temperature effects... most towers are flexible enough to not offer a lot of restraint/stability in the longitudinal direction. They're only there for vertical support. Presumably, the longitudinal load path wasn't affected by this failure.